What Are Pneumatic Conveyors and How Do They Work? A pneumatic conveyor uses vacuum pressure in a fully enclosed tube to pull or force materials from one point to another. A pneumatic conveyor is an excellent alternative to conventional mechanical conveyors with moving parts that are out in the open, because a pneumatic conveyor can contain fine particles and move them more rapidly. This creates a superior system for powder handling, particularly when you consider that there are no moving parts for the powder to get caught up in along the way. Most bulk material handling systems use pneumatic conveyors because they are efficient, cost-effective and clean. Because the system is fully enclosed, it greatly reduces any dust or wasted material during transfer. Without a fully enclosed conveyor, it is very difficult to completely protect the material from any kind of contamination during processing. Free Resource: Click here to a free downloadable PDF version of this guide that you can print out and use as a reference. There are many components involved in the construction and operation of a pneumatic conveyor. It all begins with the air compressor that creates pressurized air in the system. The compressor pulls in air from the surrounding atmosphere and decreases its volume while increasing its pressure at the same time. This results in a vacuum that has enough force to move particles. The system is also equipped with a bin vent filter to filter out dust when the material is entering or exiting the conveyor for storage areas like a silo. The arrangement of the piping or tubing in a pneumatic conveyor system is very important. Because this piping doesn’t need large platforms like a mechanical conveyor, the piping can be designed to avoid obstacles in a plant and create a network that sends material through the whole facility. Customized system designs make it possible to work around existing structures and integrate pneumatic systems into large commercial facilities. Although a pneumatic conveyor is a specific type of conveyor that is notably different from a mechanical conveyor, there are two different sub-types of pneumatic conveying systems that should be distinguished for their various features and benefits. There are dilute phase pneumatic conveyors, and then there are dense phase pneumatic conveyors, and each is optimal in a different setting. Read on for a detailed description of each. The first type of pneumatic conveyor is a dilute phase pneumatic conveyor. Dilute phase conveying is a high-velocity process that makes use of positive or negative pressure to push/pull materials through a tube. The dilute phase is most often used for fine materials, although it can be used for almost any fragmented material including wood chips, grains, etc. Because it can be used in applications where product degradation and high material velocities are never an issue or concern, dilute phase conveyors are often found in food and chemical processing, pharmaceutical, mining and even dairy. Dilute phase conveying can be done using positive or negative pressure, with each pressure type working best for particular applications. For example, positive-pressure dilute phase conveyors are best suited for conveying materials loaded from a single entry point to one or multiple destinations. Positive-pressure systems can transport materials over a relatively long distance and use a minimum quantity of air to move the material. In the same way, negative-pressure dilute phase conveyors work best when transporting materials loaded from numerous inlet points and discharging them to a single point. Furthermore, there are several dilute phase conveyor system designs. A closed-loop dilute phase conveyor uses an inert gas as the conveying medium to convey the material in a closed-loop system. 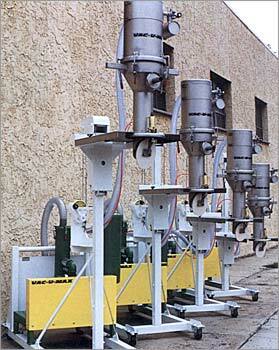 This type of dilute phase conveying is useful for handling hazardous chemicals. The primary advantage of a dilute phase conveying system is that it suspends particles during motion and transports them at a high velocity to their destination while keeping them contained in a closed loop. This results in efficient and clean bulk material handling, which is highly desirable in many industries that regular handle bulk quantities of material. Dense phase conveying, also referred to as non-suspension flow, is the other method of pneumatic conveying. The main differences between dilute phase and dense phase are pressure, the solids’ properties and the rate of conveying speed. More specifically, dense phase conveying deals with the transportation of abrasive, friable or heavy materials such as sands, soils, minerals, food, paper scraps and rocks. Dense phase conveyors push materials through at a low velocity with a low air-to-material ratio. Often, dense phase conveyors use an air compressor to generate high pressure levels to move materials through the system at an average of 275 feet per minute. Industries that typically benefit from dilute phase conveyors include pharmaceutical, chemical and food processing, foundry, mining, plastics and cement. A dense phase conveyor is an enclosed tubular conveyor that is operated through air pressure and is typically gravity or vacuum-loaded while discharging materials from the bottom; however, there are several different dense phase conveyor designs. The bottom-discharge design in particular lends itself well to dense phase conveying because the materials being conveyed are so densely concentrated that they will naturally deposit at the bottom. Movement within gravity-loaded dense phase conveyors is typically generated by a blower at the starting end of the conveyor, although vacuum-loaded dense phase conveyors pull products through using a high-powered vacuum located at the conveyor destination. When the material being conveyed is fluidized, it deposits at the bottom much like a deposit of liquid and is dragged, or pushed, along the bottom. In dense phase conveying, there are two different manners of flow: moving-bed flow and plug flow. Moving-bed flow occurs when the material is conveyed along the bottom of the conveyor pipeline, whereas plug flow occurs when the material is conveyed in units, called plugs, which are separated by air gaps rather than one fluid body. A full dense phase conveying system has many mechanical components and pieces of equipment that work in tandem to process bulk material. The system funnels pressurized air into a vessel that is fed by the storage silo. This compressor is regulated by both an air receiver and an air control panel. Since different bulk materials will need different pressures to achieve motion, operators can input the appropriate pressure into the main control panel. The pressure pushes the particles through the tube and into a deceleration zone before dumping them in the receiving bin. This bin also has a controlled environment where the pressure can be regulated externally using an interface with a set of operator-friendly controls. The main advantage of a dense phase conveying system is that it has the ability to transport heavy materials and particles because of the extremely high pressure that it creates. A low velocity system requires less air and is gentler on materials, which in turn reduces wear on the system’s equipment. Many industries who deal with bulk materials on a regular basis employ a dense phase system because it doesn’t do extensive damage to large particles during motion. Pneumatic conveyors are a popular choice among many industrial facilities because of their efficiency, reliability and easy access for cleaning. 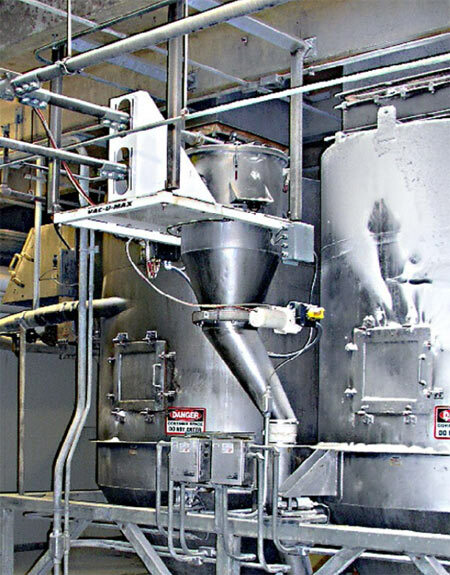 Pneumatic conveying reduces dust and protect materials from contamination during transfer, making it one of the best solutions to the problem of how to move material. From agriculture to food processing to chemical engineering and beyond; pneumatic conveyors are relied upon every day to complete important functions and safely transfer products that end up in our homes and workplaces. Have any questions or thoughts you’d like to share? Pneumatic Conveyors A pneumatic conveyor uses vacuum pressure in a fully enclosed tube to pull or force materials from one point to another. A pneumatic conveyor is an excellent alternative to conventional mechanical conveyors with moving parts that are out in the open, because a pneumatic conveyor can contain fine particles and move them more rapidly.